When Danica Roem takes the oath of office in Virginia’s statehouse on Jan. 10, the country will finally have an LGBT legislative caucus where the “T” isn’t simply aspirational. For her historic accomplishment, Roem deserves the acclaim and unmitigated respect of the entire LGBT community. Not only did she demonstrate great courage in running as an openly trans candidate against a 13-term incumbent, but in defeating Robert Marshall she banished from public office a man who had brazenly styled himself “chief homophobe” of the Old Dominion. From across the Potomac, we Marylanders who have long hoped to put the “T” in our own caucus, will find the day to be bittersweet as well. On Jan. 10, the Maryland General Assembly will commence yet another session without a trans lawmaker. If we choose to do so, however, we can make it the last. At the end of session, Sen. Rich Madaleno – in his pursuit of the governorship – will be vacating the Senate seat representing Montgomery County’s 18th Legislative District. Longtime trans activist and local political operative, Dr. Dana Beyer, has announced that she will run to succeed him. As an aide to Duchy Trachtenberg, at-large member of the Montgomery County Council, Dana helped expand the county’s civil rights law in 2007 to include gender identity. For the next seven years she fought to include similar protections in the local ordinances of other jurisdictions and in state law. 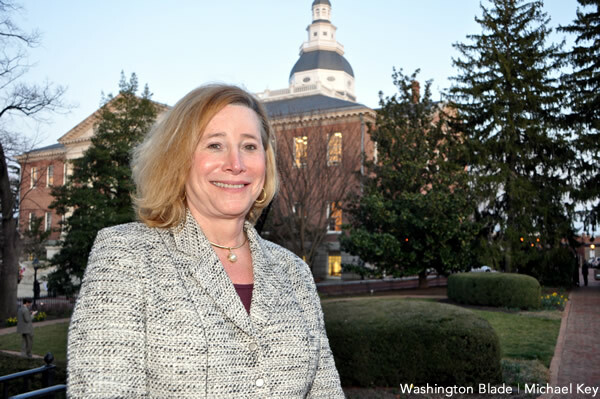 She co-founded Gender Rights Maryland to secure passage of the Fairness for All Marylanders Act of 2014 after previous attempts to advance legislation in the statehouse had failed. She has authored dozens of pieces for national publications, covering the full range of issues related to transgender culture, science, and public policy. She’s a relentless advocate for the LGBT community, reliably vocal about our concerns and undeniably committed to achieving full equality for every one of us. Given the daily menace to LGBT people that emanates from the White House, we must find and promote in the coming election season those individuals best suited to the task of fighting back. We must elevate strong candidates who will be equally strong political leaders. As it stands, too many local politicians can muster no more resistance to Trump’s policies than cavils and quips in their tweets and retweets. We need instead someone who can define a strategy, rally our efforts, and lead the counterattack from Annapolis. With Beyer in the Senate, we will have an official in Maryland who does more than “hold our ground.” She will further the work she herself has already done to make this state even more welcoming for each member of the LGBT community. Six months ago I openly lamented the absence of an LGBT candidate in Maryland whose candidacy I could support. I argued then, as I reiterate now, that our gay and lesbian incumbents cannot be trusted to advance our issues on their own. Without Equality Maryland to nudge them on, they are aimless. I have returned to update my statement only by saying that Beyer is the candidate I’ve been looking for. I’m eager for the start of the Maryland General Assembly’s 2019 session. I intend to sit in the gallery and watch Dana Beyer take the oath of office as the next senator from the 18th Legislative District. On that day in January, I will be more confident in the ability of Maryland’s legislature to look after the well being of LGBT people living here. Victory in the race will confirm the “Trans Potomac” political moment that began with Dana’s activism, that has led to Danica’s election, and that will culminate when the doctor becomes a senator. Every LGBT person in the greater Washington region, as well as those who live in parts of Maryland beyond the beltway, should recognize its importance and work to make it real. We will all be better for it. Brian Gaither is an LGBT activist living in Baltimore. Follow him @briangaither. The last thing the trans community – in Maryland and the nation overall – needs is a vanity politician who, four years ago, rewarded the man who carried the state’s trans equality bill over the finish line by challenging him in the Democratic primary. The trans community – in Maryland and the nation overall – needs trans people in office, but it does not need Dana Beyer to do anything other than to go away. Good luck, Dana. As to Katrina’s criticism: I am afraid that “vanity politician” is redundant. I also note that many radicals who are nominally on “our side” are much harder on our allies than on our sworn enemies. But you had a right to run in that earlier race, and having two allies competing for LGBT support is a nice problem to have. It has long been common in DC politics. The prospect of our being told who can run and who cannot is distinctly dystopian to me. Unfortunately, some of us embrace every form of diversity except diversity of opinion.